A diplomat’s remembrance of his tenure in war-torn Afghanistan. In the aftermath of the 2001 American invasion, Afghanistan has struggled to convert a national trauma into an opportunity for transformation. To that end, American diplomat Crowther traveled to its southern Uruzgan province in 2011 as part of a provincial reconstruction team. He was charged with the daunting task of building a legal system that upheld the principles of the country’s fledgling constitution. The challenges he faced were many and considerable. 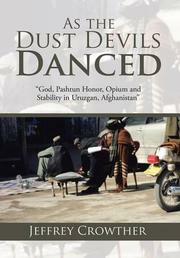 Of course security risks were omnipresent, and the author provides chilling accounts of the danger of suicide attacks. The creation of a new legal code required more than just the establishment of new institutions and agencies, so Crowther reflects insightfully on the problems that Afghan culture posed to reform. Laws in Afghanistan have historically been handled at the tribal level, and the seemingly infinite fissures between warring factions made the establishment of a single legal code extraordinarily difficult. Also, Crowther had to contend with the tug of war between rival religious sects, particularly the more modern Sunnis and the revanchist Salafists. The question of gender inequality recurs, and the author writes with credible clarity about the precarious predicament that women found themselves in. Ultimately, Crowther learned some hard lessons about what was necessary for judicial uniformity and national unity: “In the end, the diverse regions will remain autonomous, and whatever government holds power in Kabul, it will be based on a confederacy of self-interests and the art of the deal.” Although he often delves into complex policy issues, he largely avoids technical, wonkish language, but readers may tire of deciphering the book’s stream of bureaucratic initialisms. The personal and the political combine into a seamless whole as Crowther shifts quickly from his expert analysis of Afghanistan to visceral accounts of his particular experiences. Overall, this debut should satisfy readers searching for an empirically rigorous but breezily anecdotal account of one of the most tempestuous nations in the world. It includes a generous sprinkling of black-and-white photographs documenting the author’s travels, including portraits of some of the men and women who figure prominently in his account. A gimlet-eyed meditation on a troubled country’s progress toward political and legal reform.